It is with great pleasure that I announce that I will be hosting Aspiring Bakers’ 18th Baking Event. The theme for this month will be Layered Cakes!! Aspiring Bakers is a monthly baking event meant to encourage and ASPIRE bakers to bake according to a new theme each month. I suggested a layered cake theme, because what is life without cakes? I don’t believe I would be able to survive in a cakeless world! If you think back to your favourite celebrations, chances are many of them have involved candles flickering over beautiful cakes. 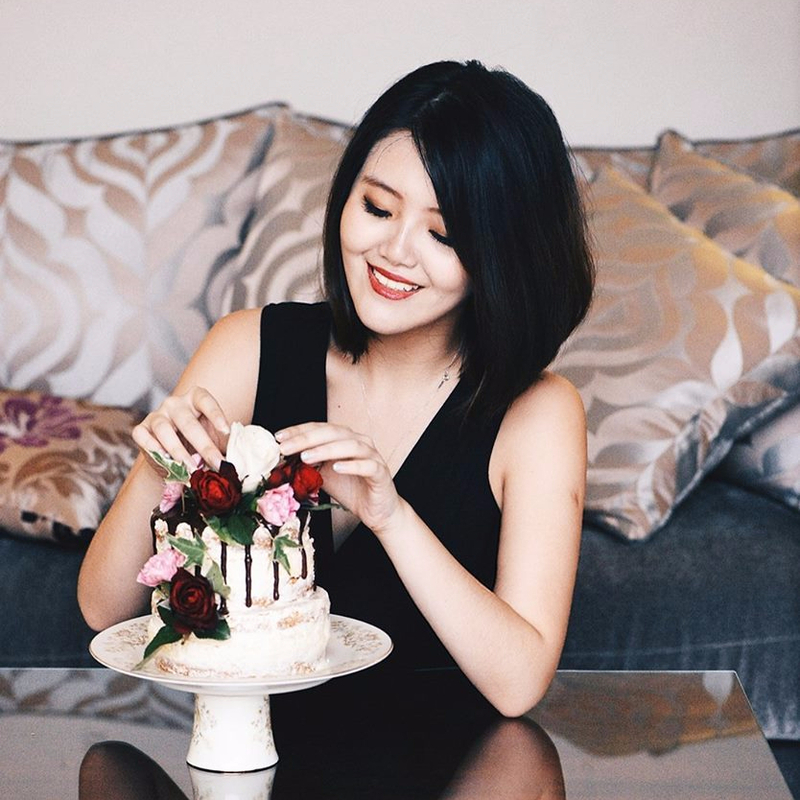 Be it birthdays, Christmases, weddings, convocations or other milestones we celebrate in life, cakes are significant and often central to most of these events. In my case, when I look back on these events, the first thing that comes to my mind would be the cakes I baked! I thought to myself; what could be more lovely than a cake? It would be a home-made cake baked with LOVE! That is, to me, the icing on the cake (literally). With that in mind, this month’s theme is to make frosted layered cakes! Red Velvet, Black Forest and Tuxedo cakes are some popular examples, but new creations are certainly welcome! 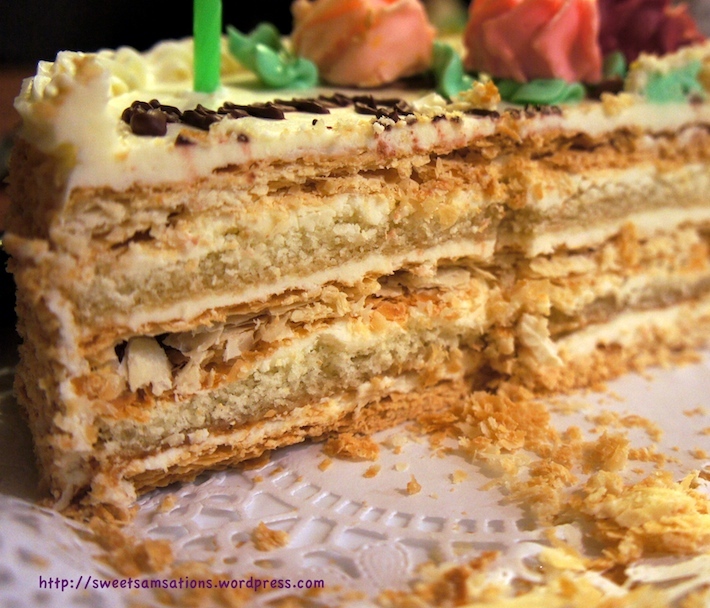 Some examples of cake layers include jaconde, chiffon, sponge, butter cakes, dacquoise, mousse cakes, cheesecakes, ice-cream cakes, chiffon, etc. Here are some rules for joining this event! Cake has to be at least 3 layers. No maximum. Sorry no traditional kue lapis this month! Cake exterior has to be at least partially frosted or decorated – Frosting examples include but are not limited to ganache, buttercream, whipped cream, jelly etc. You can choose to frost just the top, just the sides, or the entire cake if you wish. If you do decide not to frost and instead to decorate your cake, make sure there are no bare spots! An example for decorating the top would be Tiramisu which has cocoa powder sifted on the top. For the sides, an example would be lady fingers or kit-kat bars surrounding the entire cake. Please feel free to e-mail me or leave a comment if you have any questions! 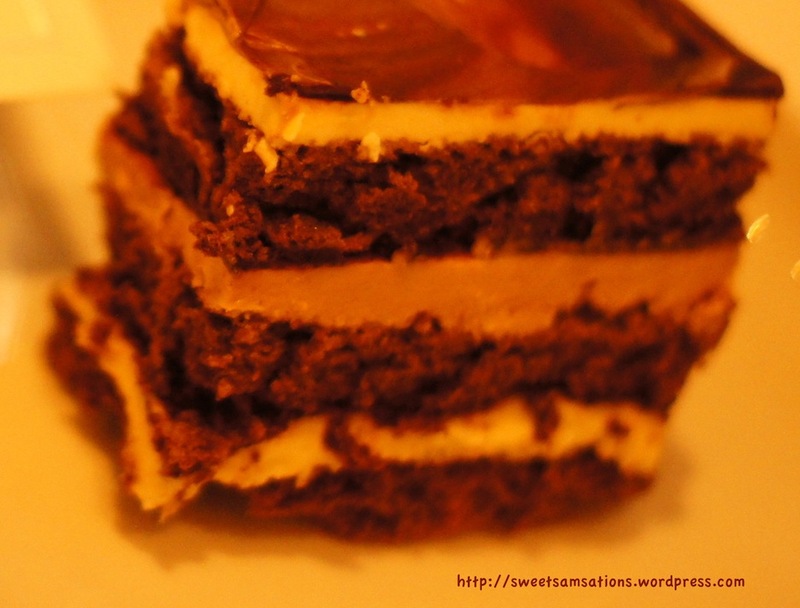 Make a layered cake, in the month of April 2012. Post it on your blog between 01 April 2012 and30 April 2012. Any entries that are posted outside the date range will not be accepted. Any entries that do not include a recipe or link to the original recipe will not be accepted too. Please mention that you are submitting your post to Aspiring Bakers #18: Layers of Love (April 2012) hosted by Sam of Sweet Samsations and provide a link back to this post HERE. Entries will not be accepted if the above is not included. Please use “Aspiring Bakers #18” as your email subject. You may submit more than 1 entry. The roundup will be posted on 01 May 2012. I greatly look forward to all your delicious and creative recipes!! If you are interested to find out what’s on the previous Aspiring Bakers #17: March Macaron Madness! (Mar 2012) entries, hosted by Alan of Travelling Foodies, see the roundup HERE. Hi Samantha! Thanks for hosting the event! Just need to clarify one thing though. The “minimum requirement” of three layers refer only to the cake layers or does it include collectively any layers of mousse, buttercream or ganache which are used to interlace the cake layers as well? Thanks! Great question Alan! 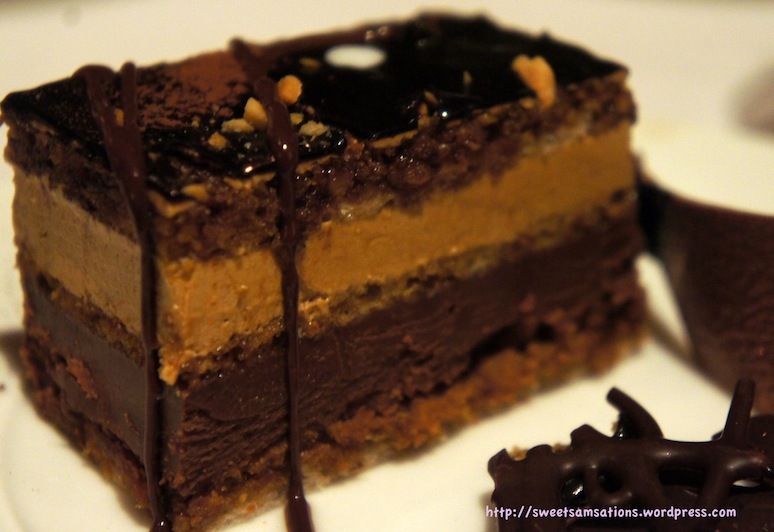 The layers are “cake layers” and does include mousse layers but in general not ganache, buttercream or whipped cream. I’d like to think of the latter three as frostings instead of a “cake layers”. Good rule of thumb is that if you could eat it by itself, it’s a cake layer. Eg: Cheesecake, mousse cake, sponge cake, pound cake, biscuits, ice cream cake, cookie cake etc etc. Although I am aware that some people do eat buttercream by itself (true story! ), I think most people consider it a frosting for spreading on their cake layers. For example: http://www.raleys.com/images/imagescontent/1099399.jpg is definitely a 2-layered cake. I would hardly consider the middle frosting as a layer. 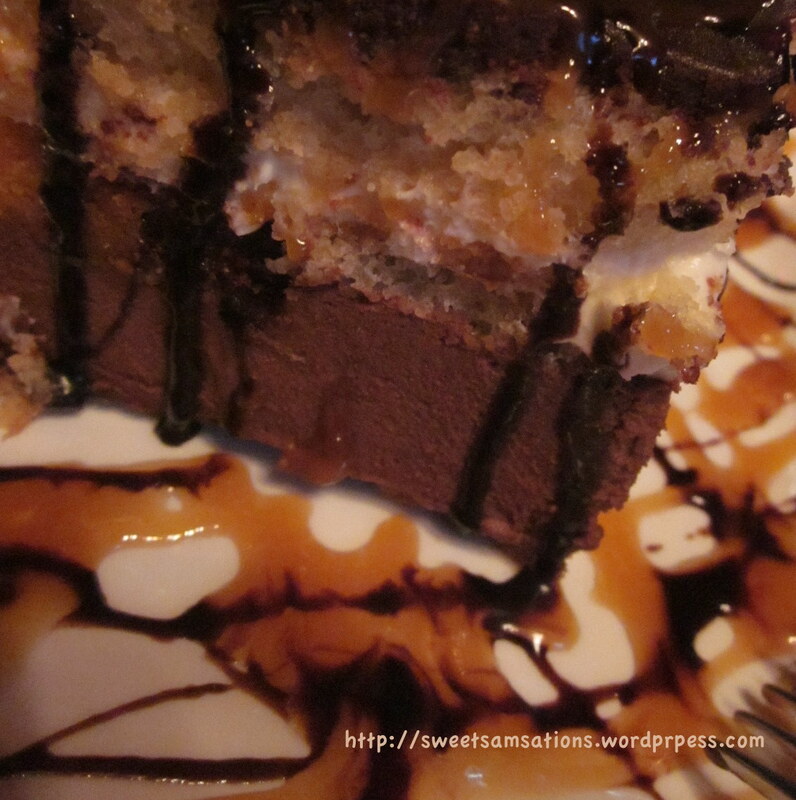 http://thumbs.ifood.tv/files/images/food/american-chocolate-layer-cake-01.jpg would be 3 layers! HI Samantha, thanks for the clarification. Does the exterior have to be frosted? I have some entremets up my mind but the exterior is not gonna be frosted though… here’s something which I’d made in the past to let you have an idea of what I mean. Hi Alan! Your cake here is a thing of beauty! It’s nowhere near a “feeble attempt”. To answer your question, as long as either the top or sides are frosted, then it qualifies! hahaa.. Thanks Bam! No worries!! Best of luck on your midterm! Sounds intense! But I’m sure you’ll do well 😉 Take care too! If not i’ll have 3 cakes. Wait… so Tiramisu, with 2 layers of sponge and 2 layers of cheese filling, does that count as 4?? ok , then now I have 3.
the one with whipped ganache will be on this friday. If that one counts, i’ll give you 4 entries. I am not a baker, but this sounds like a lot of fun. I cannot wait to see all the creations. Your cake photos are so lovely, my favorite is the opera cake. Thanks Norma! Opera cakes are gorgeous classics! Hi Samantha, thanks for hosting this month’s Aspiring Bakers! I’m really excited to bake some mini layer cakes! Can’t wait to see what others are going to bake as well! Hi Sam, love your new blog look by the way! I will try to see if I can do layered cakes this month, and I will let you know. Great idea! Hmm… I hope I didn’t leave duplicate comment. but I love your new blog look by the way 🙂 And I will try to see if can whip up layered cakes this month to be submitted to your fun event. Great idea! Hi Yudith!!! Thank you! I am definitely looking forward to your cake!! Looking and pretty cakes is probably a secret fetish of mine! LOL. Can’t wait to see yours! I bet they’ll turn out superb! 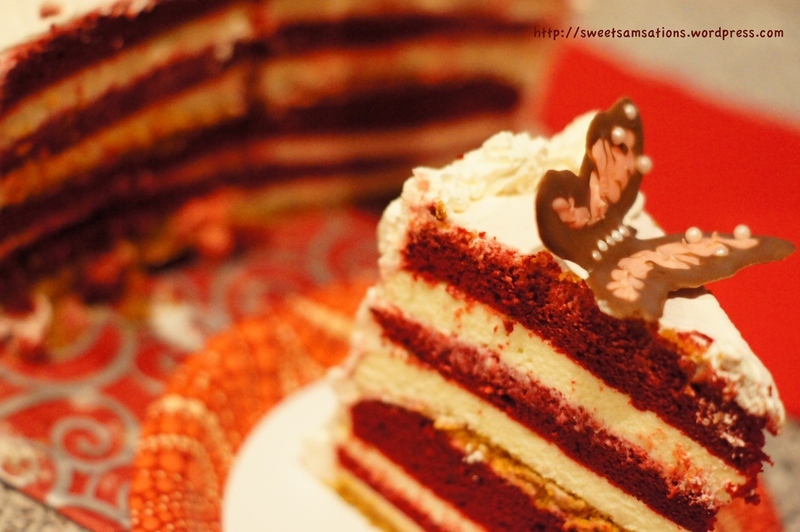 I still don’t get what all the action around red velvet cake is…non-the-less, your cake is very decadent looking. Hi Eva, thanks! Although it’s true that Red Velvets are a little overrated, I have to say that they are still one of my favourites! I know that they are merely chocolate cakes with a lot of red dye and buttermilk, but there’s just something about the red and white symbolism which builds magic around the cake! It’s probably the cream cheese filling / frosting too! I guess I’ll be on this bandwagon for a while! Is layered cake without filling accepted? eg. Indonesian kueh lapis? Or something like those layered cakes with only jam spread in between.. are these counted? Another question…is decorating the sides of the cake has to use frosting only? If I want to use, let’s say wafer/cookies crumbs/jimmies/chocolate sticks – arranged at the sides of the cake…is this allowed? Hi Alice! The pleasure is all mine! Thank you for supporting this month’s theme! I’m definitely looking forward to your cakes!! Your blog has nothing but incredibly mouth-watering dishes that makes me miss home so much! hmmm.. We will leave lapis out for this month’s theme. Since traditional lapis does not have frosting / decorations to it. In this theme, we would like to see more frostings in our cakes! As for your decorations, your cake does not have to be only plain frosting! You can definitely feel free to add on decorations on top of the frosting, like graham crumbs, chocolate plaques, or shredded coconut, to name a few examples. My interest has already been piqued by your descriptions! I definitely can’t wait to see your entries!! Have a great week too!! Hello Ann! That’s awesome! I’m glad I’m able to get to know you AND your delicious kitchen too! Definitely looking forward to the goodies you will be bringing to the table! Most definitely Raymund! Bet you’re going to make a fine looking one with the prettiest pictures! Oh, look at all that deliciousness! I may have to join in on the cake fun! I’m forwarding you some blog love. Come take a peek! Hi Samantha, my first time coming over here. Thanks for hosting the AB for this month! thanks! i will submit my post before end of april! hehehe! thank you for hosting this AB….really admire you all….ur blog so nice…. Hi, Samantha. What an interesting theme, something unique this month. I will try to use own creativity to make this. Nice to meet you too! I’ve seen a lot of your creativity and I know this is definitely up your alley! Can’t wait! Layered cakes are my favorite thing to bake! Totally taking part in this. Oh perfect!! That’s awesome to hear Joanne! You have a whole recipe index of wonderful looking cakes on your blog. Glad to be seeing more! Thanks for sharing my excitement Juliana!! I am definitely looking forward to the round up at the end of this month! I am already excited by reading all the comments here. May I know is something like pandan layer cake qualified? The layer is made up of sponge cake and agar-agar/jelly. Can the frosting be the agar-agar/jelly or mousse? One day I will definitely try it! Great job on your beautiful cake!! I LOVE Tiramisus! This event sounds too exciting! I am trying to think of a cake I could bake which has 3 layers. Wow. I will try and work on something special for this event. Hope I can come up with it. Your cakes look decadent and absolutely divine!!! You really are a gifted baker. I’ve emailed details of my post for this event yesterday. I’m wondering if you’ve received the email because on my side, there’s no indication that the email hs already been sent although I’ve ‘send’ twice! I really don’t want to miss this month challenge. Thanks. I made a triple choc cheesecake, does it qualify for this theme? However the top is jus choc ganache.. So perhaps it wldnt be considered as 3 layers min? ?